Why I ever thought I’d have time to write in the middle of moving farms is beyond me. Too busy, too crazy, too hectic. Everything costs more, takes longer, and Murphy keeps poking his nose where he’s not welcome. One of the worst parts is vehicle woes. On the last trip to Vermont, the Audi decided she wanted a new wheel bearing or at least that’s our guess. We now know who around here to take it to, but man, she sounds horrid. So I’m stuck here with no wheels. It’s a good thing I brought my bike! Someone needs to remind me again why we got Icelandic sheep. We thought the fence breaking was something in the water in Marlow, but evidently, it’s just the sheep themselves. 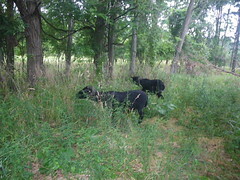 Yesterday, they walked out of gorgeous new pasture, through three electric fences, one barbed wire fence, through a swamp, over a mountain (well, hill) and through the woods. I’ve managed to get most of them back but four are still out and have no interest in coming back. Hate. When those four remaining are loaded, the temptation to take them straight to the butcher is strong. The stuff I said while wading thigh high in the swamp, lost and getting bug bitten … not fit to print. Birch, on the other hand, has decided to hang with the beef herd. He always did like cows best, and used to hang out with Danny. The only time he hung with the ewes was when they were in heat. I’m about to let him go hang out with Danny in the great pastures in the big blue sky. We have one of his lambs this year that is the spitting image of him yet much more tame, much nicer, and my temptation is to ship Birch off to freezer camp and have dog food for the six (!) dogs and keep the lamb. But the lamb might not be up to the task of settling the older girls this year, so I’m not sure. What I do know is we can’t keep a ram lamb and Birch because we tried that last year and Birch killed the ram lamb as soon as the girls went into heat. Ugh. We were so used to sweet rams like Sue. Frank has been bringing over a load of stuff and critters every few days, hauling the trailer each time. The trip is pretty tiring after he’s spent days loading and today, the clutch decided it had had enough. So now he’s got to figure out how to get it someplace to get replaced, and without me there with a working vehicle to help. Murphy, Murphy, Murphy. Really. Cut us some slack already. 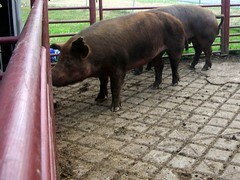 We got three of the Tamworth sows down to Adams Farm in Athol, Mass. The hanging weights were pretty impressive: 591, 473, 448. About half of that is sold, but it’s a lot of meat. If you are interested in lovely heritage pastured pork, please get in touch with Frank at frank@mackhillfarm.com . We may have a home for the remaining sows and are talking to someone about them now. I’m glad. Those girls are great mamas and so sweet and tame. Albus will be the last to go, and he’s off to the butcher. I bet he’s over a thousand pounds. We don’t have boar taint in our herd, so that’s going to be some massive amount of pork again. Our freezers may not be able to handle all of this, so again, we have BACON! SAUSAGE! Come help put up the tent and I’ll stuff you full of it. Taste test after you work up an appetite. Frank says one of the Icelandic hens hatched a couple of ducklings yesterday. Evidently, when she went broody, all the nest boxes were full, so she grabbed a clutch of duck eggs on the floor of the coop. Too cute! She’s going to be in for a surprise when they want to go swimming. 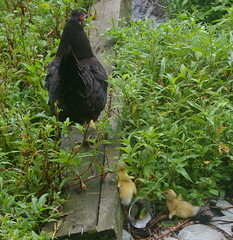 Anyone remember when I had a turkey hen hatch ducklings? That was one adorable family right there. I was so sad when the raccoons got them all back before we had the Pyrs. One thing about the weather and how different it is here. This house is surrounded by hayfields and pasture. It’s lovely in almost every way. (except for the part where I’ve got hay fever again) But the storms feels so different than they did in our log cabin in the woods in New Hampshire. Wow. The house got struck with lightening the other day, knocked out the fencer which was not good for electric fence chargers, that’s for sure. Fried it good! Still, we’ve had some nice rain in the last few days and that’s been well needed and lovely. While there was a tornado warning just south of us, we just got mostly rain and it was just delightful when it wasn’t scary with the thunder and lightening. It feels so much more exposed though and is going to take some getting used to, for sure. I’ve signed us up with a pretty cool “farm stand” concept with a pick up a mere half mile from the house at the Larson Farm. It’s part of YourFarmStand.com, and the theory is that people in the area can place an order and then pick up is every other Thursday from 4-6. Quite a few local farms are participating. I linked directly to the Wells entry, but here’s a drop down menu to find the others at the top of the page. So far, I’ve only put up some of the bacon and sausage that we have on hand, but I’ll put up a bunch more once I see what has sold and what hasn’t. I’m also deciding what canned goods to do, but have dill relish up for now. As soon as I get my double oven moved here, I’ll start baking bread again and put that up. It was pretty popular in New Hampshire and I’m thinking of giving away some loaves to see if I can get a following here too. 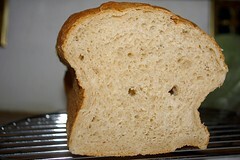 Who wouldn’t want yummy, soft and squishy yet healthy bread? Lard! Maple syrup! Yum. I’m rambling. Time to go to bed. After 8! This entry was posted in Moving Farm. Bookmark the permalink. Post a comment or leave a trackback: Trackback URL.